The 2018 Mid-Autumn Festival and Carnival is on September 24, 2018. The Mid-Autumn Festival and Lantern Carnivals in Hong Kong take place in many parts of the territory and run for a few days before and after the festival proper which is celebrated on the 8th Full Moon in the Lunar Calendar, usually around September/October in the Western calendar. Together with the Tai Hang Fire Dragon Dance celebrations, they are the centerpieces of the festivities of the Mid-Autumn festival or Moon festival as it is also known. On this full moon day, families and communities traditionally gathered to celebrate the bountiful harvesting season, somewhat of the equivalent to the American Thanksgiving Day. Nowadays, families and friends take part in the many lantern carnivals and celebrations around the city. 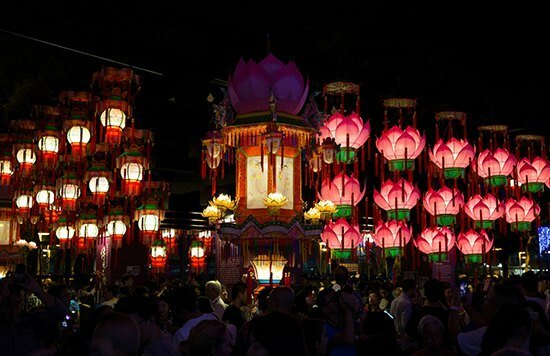 The Lantern Carnivals, besides showcasing an incredible variety of colorful, bright shiny lanterns, feature also many cultural events and performances including song and dances, kung fu, acrobatics, craft demonstrations and the like. If you happen to be in town during this period, be sure to check them out! The Hong Kong Leisure and Cultural Services Department (LCSD) sponsors many of the events. The displays and cultural activities are free to the public. When and Where are the Lantern Carnivals, Displays and Parades? The 2018 Hong Kong Mid-Autumn Festival is on Monday, September 24, 2018. The major carnival in Victoria Park takes place on this day. Other Lantern carnivals, displays and exhibitions will start in early September in Tsim Sha Tsui and will likely run until early October. Mid-Autumun Urban Carnival at Victoria Park - Monday September 24, 2018. This is the all-in-one event that offers the lantern displays and a full cultural programme including a Fire Dragon Dance, kung fu demonstrations, folk songs and crafts. Tsim Sha Tsui "To The Moon" Interactive Lighting Installation - September 15 - October 1, 2018, set up at the Hong Kong Cultural Centre Piazza, just steps from the Waterfront. Opening hours for installation will be Saturday to Monday from 6:30pm - 11pm, until midnight on September 24. There is also a Lantern Making Workshop from September 22 - 25, 2018 from 7:00 pm to 10:00 pm, each session lasts for 30 minutes, spaces are limited and first-come-first-served. The Tai Hang Fire Dragon Dance Parade - September 23 - 25, 2018. Not a typical Dragon Parade and unique to Hong Kong. 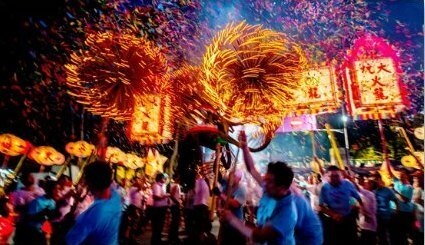 The 67-metre Fire Dragon will wind through the streets of Tai Hang, like it did over a century ago with over 300 performers, 70,000 incense sticks, and lots of firecrackers. All programs are free, public is free to roam around the beautiful lantern displays. This is the all-in-one mega event that offers magnificent Lantern Displays, a full cultural programme, and a Fire Dragon Dance Parade. 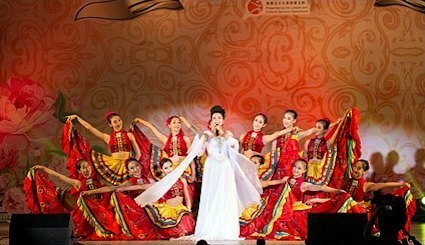 The cultural program which varies from year to year includes kung fu demonstrations, folk songs and dance shows, acrobatics, and a variety of entertainment. In addition there are many exhibitions and workshops such as traditional hand-made lantern exhibitions, demonstrations of Chinese folk arts and crafts including paper-cutting, clay figurines, woodblock printing, etc. The Fire Dragon Dance is a main part of the Mid-Autumn celebrations. The parade features a 67-metre long dragon with thousands of burning incense sticks and over 300 performers which will circle around the throngs of visitors at Victoria Park. 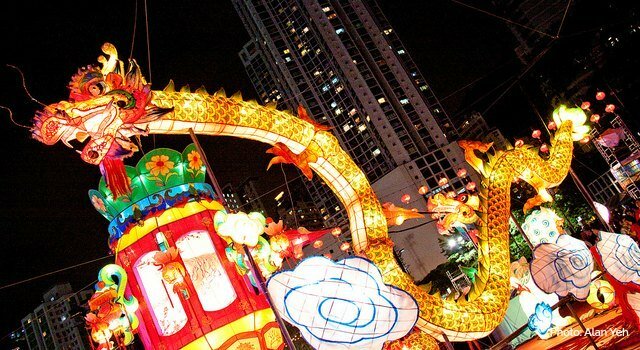 If you miss the Fire Dragon at Victoria Park, catch it in Tai Hang on September 25 . Here's more on the Tai Hang Fire Dragon Dance Parade. 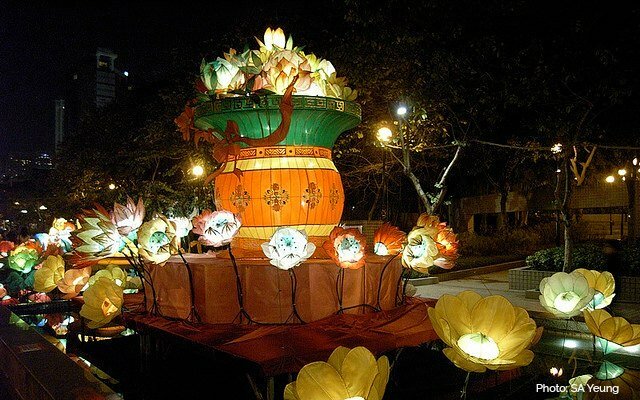 Bright and colorful lantern displays turn Victoria Park into a magical land, the displays are lit every night from 6:30 pm to 11:00 pm, and there is also an Exhibition on Craftsmanship of Lantern Making. In previous years, the highlight of the event was a monumental state-of-the-art Lantern Wonderland which chose a main signature piece through a design competition organised by the HKTB and several design organisations. The Design contest was held months prior to the festival and the winning entry was showcased during the Mid-Autumn Festival. The 2013 Lantern Wonderland centerpiece winner was "Rising Moon", a 10-meter half-dome completely made from recycled water bottles and LED lights with fantastic light effects that mirrored the phases of the moon. You were able to enter the structure which had a capacity of 100 people, and from the inside you could see the hanging lantern-bottles suspended from the periphery of the half-dome, which also had an opening so you could enjoy the real moon on that fantastic full-moon night. For 2012, the winning centerpiece was the "Golden Moon" set up on a water pool and standing 18 metres high. It was a warm reminder of the full-moon symbolism of family reunion of the Mid-Autumn festival. The half-dome structure was lit up at night in conjunction with synchronised music. 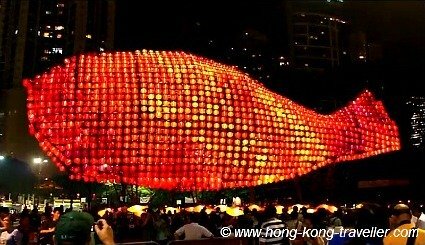 "Lee Kum Kee Lantern Wonderland"
The 2011 centerpiece of the celebration was a giant fish-shaped lantern, created with over 2,000 lanterns, it made it into the Guinness Book of World Records as the largest sculpture made of lanterns. Together with a 3-minute coreographed program, this beautiful massive lantern delighted visitors who enjoyed the musical light show which replayed every 15 minutes. No design contest has been announced for the 2018 Lantern Displays at Victoria Park, but the showcase never dissapoints! 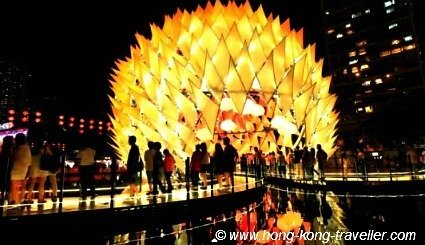 In the same way as the Spring Lantern Festival, the LCSD sets up an amazing Lantern Exhibition in Tsim Sha Tsui near the Waterfront Promenade. This one is fairly easy to pop in for tourists as it's just around the corner from the Star Ferry Terminal and the TST metro station and you can enjoy the beautiful displays as you stroll around the Clocktower and the Promenade, and maybe take in the Symphony of Lights show which is featured every night. The 2018 displays will be set up by the Hong Kong Cultural Centre Piazza by the Clocktower and are the longest running. This year's theme is "To The Moon" and for the first time, this is an interactive lighting installation. 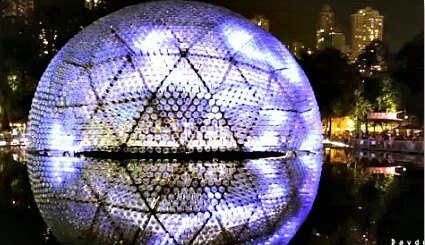 Likewise at the other Carnival sites (Victoria Park, Tuen Mun Park, Tai Po Waterfront Park), the lantern displays will run for a few days before and after the festival. 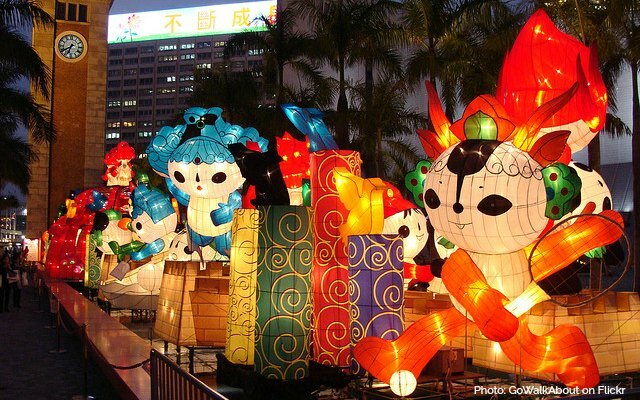 For more information on this year's Mid-Autumn Lantern Carnivals and Exhibitions check out the official site of the Hong Kong Leisure and and Cultural Services Department at www.lcsd.gov.hk. Lee Tung Avenue is getting ready to host some fantastic events this Mid-Autumn Festival, this year, look for the illuminated Moon Rabbits! The world class inflatable art installation which has appeared in over 80 cities is coming to Lee Tung Avenue. 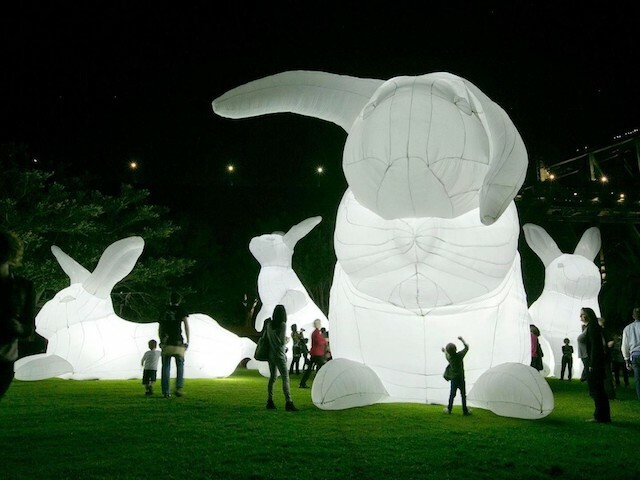 In collaboration with world-renowned Australian artist Amanda Parer, it will showcase ten giant "Moon Rabbits" that come in different forms, with the tallest being seven metres tall. For the first time, a smart lighting technology equipped with iBeacon transmission will turn the shopping street into the "Avenue of Lights" with over 800 colorful lanterns. Also during the Mid-Autumn Festival period, the LED fire dragons will be out full force around the shopping center, lighting up the traditional market set up for the ocassion and the many demonstrations and workshops in all matter of crafts, lantern-making, knot-tying, paper cutting, puppetry, sugar-candy blowing, etc. There will be a dragon parade which the public will be able to join around the giant Moon Rabbits. 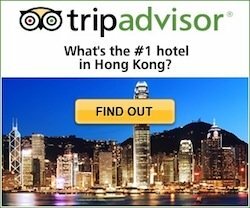 Follow Hong Kong Traveller's board Mid-Autumn Festival in Hong Kong on Pinterest.